As sand travels through the hourglass, so does my quest for youthful, glowing skin. Just a week ago, I was lucky enough to experience my first microdermabrasion with a wonderful aesthetician, Robin, of Robin Marie Skin Care in Costa Mesa. Not only did I get to experience the gentle exfoliation of microdermabrasion, I also learned a lot about microdermabrasion and tips on how to achieve healthy, glowing skin. With microdermabrasion, I was excited to learn that it exfoliates and removes a layer of dead skin like a chemical peel, but there is no delayed peeling! There are two different kinds of microdermabrasion technologies out there: crystal and DiamondTome. 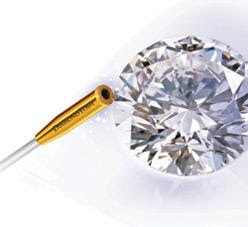 The DiamondTome system, on the other hand, replaces the micro-crystal flow with a disposable or reusable diamond tip wand. Areas closer to the eyes and mouth can be abraded more accurately with diamond abrasion (no risk of stray crystals causing damage or being ingested). Also, one of these treatments is equivalent to FOUR crystal microdermabrasion treatments, so the investment is well worth it. Hello, selling point! And besides, wouldn't you prefer diamonds over crystals??? I would! It's non-invasive, pain-free and requires no down time. To achieve maximum results, several treatments are recommended for healthier, glowing skin. I experienced the DiamondTome microdermabrasion and thought it was pretty relaxing and totally painless. After the microdermabrasion, Robin then used a hydro wand to infuse a hydrating serum into the skin for an extra boost of radiance. (There are several different serum options.) A week later, my skin feels great and still looks well hydrated. Here is a before and after example of what microdermabrasion can do! And then there is Robin...she is absolutely wonderful! She truly seems to care about her patients and doesn't try to push any products that she is selling on you. (So many offices and spas do that!) As she was doing the treatment, we had a really great conversation about the things I can do to achieve healthy, glowing skin. I knew going in to the appointment that it is important to drink a lot of water. But did you know drinking distilled water is twice as hydrating as filtered or spring water? It may not be as tasty, but hey, if I can take a shot of tequila every now and again, I can drink some distilled water! Robin also gave me some tips on making my own toner and misting spray to set my makeup and keep away excess shine. (I want glowing skin, but not thick-with-grease glowing skin!) I thoroughly enjoyed my treatment with Robin and look forward to another treatment with her again very soon. To schedule an appointment now, call Robin at 949-331-3779, or visit the website, Robin Marie Skin Care. Current specials are $50 off new clients for DiamondTome and Dermaplaning, 30% off a series of 4 microdermabrasions, and 20% off any peel. (1) lucky Houses, Couches and Babies reader can win (1) DiamondTome Microdermabrasion and hydro wand procedure from Robin Marie Skin Care of Costa Mesa (valued at $150). To enter, simply follow the Rafflecopter instructions below. The giveaway ends Sunday, August 12th at 12:01 a.m. EST. This 37-year-old SO needs some microderm!!! My skin looks so dull....I could used a facial! I've been wanting to try something new to rev up my skin!